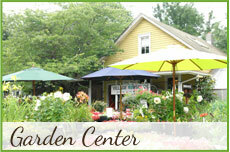 The Village Nurseries is a place for plant enthusiasts. We have many different plants, from the unusual and interesting to the workhorse plants we have come to rely upon. Our stock is continually changing, but our selection is always diverse. Some we grow and propagate in our own greenhouses and field. Others come from the many nurseries with whom we have associated during the more than 150 years The Village Nurseries has been in business. As a result, we have access to an enormous selection of plant material to share with you, our customer. Special orders are always possible when you are searching for a particular tree, shrub or perennial. "What Plants should I choose?" The plants that are described below are broken into categories to help you determine what type of plant will best suit your needs as well as to introduce you to a sample of what The Village Nurseries has to offer. We hope that these examples will tempt you to visit us at our retail location at 818 Old York Road in Hightstown. There you can enjoy the experience of choosing the plant just right for you. It may be what you came out to buy. It may be something you didn’t even know existed. Shade trees are large deciduous trees that form a major part of the foundation of your yard. Serious thought should be given to the placement of shade trees as they are an investment in the future of your home. Consider shade trees on the south side, where they will shade your home from summer sun but let the light shine through during the cold winter months. Ornamental trees are generally smaller than shade trees and are considered understory trees. These trees can provide flowers, fruit or berries, foliage color and other interesting characteristics. They usually grow between 10-30 feet in height and width. 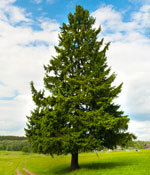 Evergreen trees, like pines, Spruces, Fir trees become large specimens and provide screening, windbreaks and structure in the landscape. Deciduous Shrubs loose their leaves during the winter but provide flowers, berries and leaf color during different times of the year. The different varieties can grow to sizes from 1-15 feet tall and from 2 to 10 feet wide and everything in between. 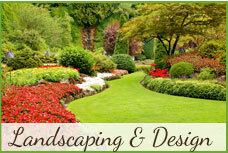 This category of plants lets us be the most creative when designing landscapes. Flowering evergreen shrubs are plants like azaleas, rhododendrons, and Andromeda. These shrubs come in many different color flowers and grow a lot of different sizes. Evergreen shrubs that do not flower are used as foundation plants, backgrounds, specimens, or groundcovers. Examples are yews, Japanese hollies, arborvitae and junipers. Herbaceous plants include many other types of plants like perennials, annuals bulbs and tubers. There is a plant that fits the requirements of any location in the landscape. The fun part is finding that particular plant and getting it to grow in your yard.